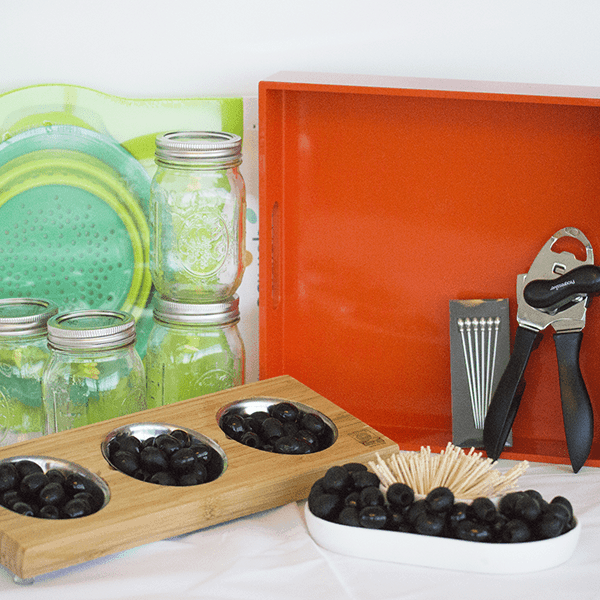 This post is sponsored by California Ripe Olives through Kitchen Play. All content and opinions are my own. Feta Cheese-Covered Olives is a fun and incredibly flavorful appetizer made with olives covered in a feta cheese mixture and rolled in crushed hazelnuts. On a scale of 1 to 10, how awesome is Summer!? I can’t get enough of this wonderful weather. In the summertime, life is as sweet as can be. The days move slower, the food tastes better, and we look a million times prettier! Wouldn’t you agree? Tan lines, chlorine-bleached hair and sandy toes are waaaay sweeter than a frostbite. Buh-lieve me. Also? Let’s be honest. 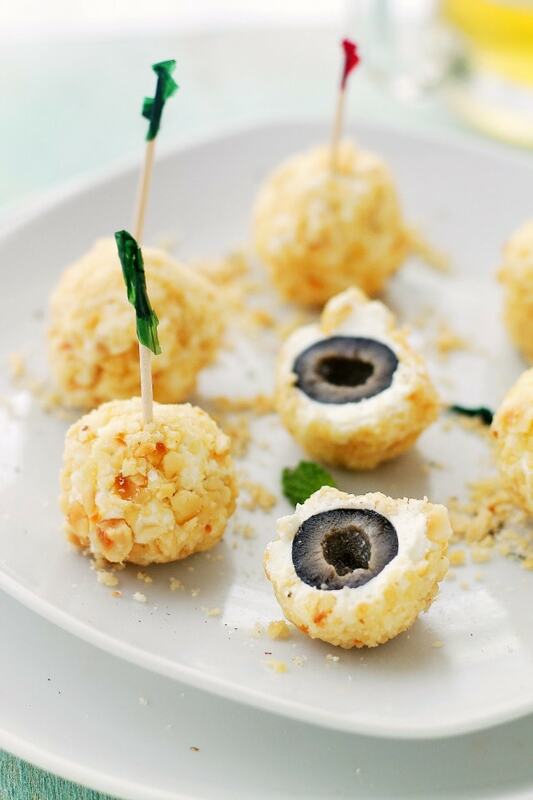 On a scale of 1 to 10, how good are these Feta Cheese-Covered Olives? I give them a hundred! You know what’s totally interesting? According to this infographic from California Ripe Olives, olives are considered a FRUIT! I had NO idea. None. Another fact about olives? California Ripe Olives are cured for 7 days! Aaaaand the recipe used for curing those olives was created back in the 1800’s! Personally, I find that incredibly cool, and I love the taste! I am known to snack on those tasty bites every so often, which would be in line with this study that suggests working moms are more likely to snack on the weekends compared to working dads. I’m also with the 44% who agree that olives are the perfect party snack! In fact, I used black olives to create this flavorful appetizer. This is a really lovely dish that starts with cheese and ends with olives. California Ripe Olives, feta cheese, cream cheese, and hazelnuts are all you will need to create your next, most delicious starter. It is the sort of snack that you can eat and feel like you’re indulging in the good life. It’s luxurious. Creamy, bright, salty, rich, and delicious. It’s a bit different, but totally tasty! Now, I’d love to see how you like to eat your olives, and by doing so, you will be entered to win this wonderful prize pack! You can be entered to win by joining my Olives Recipes Pinterest Board dedicated to snacking with California Ripe Olives! If you’d like, you can pin directly from the California Ripe Olives Pinterest Account. Check out the full set of guidelines at KitchenPLAY by clicking here. Please leave a comment below letting me know that you would like to be invited to pin to my “Olives Recipes” Pinterest Board. Include your Pinterest email in the comment. For more recipe ideas using olives, you can follow California Ripe Olives on Pinterest, Facebook, and Twitter. Drain olives and pat dry with paper towel. Set aside. In a mixing bowl, combine cream cheese, feta cheese and dill;mix until thoroughly combined. Place crushed hazelnuts in a shallow dish. Mold 1 teaspoon cheese-mixture around each olive; shape into a ball. 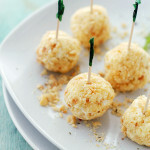 Roll each cheese-covered olive in chopped hazelnuts and set on a serving platter. can i made it night before i serve it? HI! Yep, you can definitely prepare these the night before, but keep them refrigerated. I served these last night at a dinner party and they were really good! I don’t like nuts so I only added hazelnuts to half and the other half I rolled in a light coating of dried parsley. A few people said they liked the parsley ones better. Maybe hazelnut just isn’t a popular nut around here. Next time I’ll try another nut. This is nothing against the recipe, but I did find it really difficult to cover the olives with the mixture. I had to do it in a few batches so I could put the mixture back into the fridge to harden up a bit. This was a big hit at my daughter’s graduation party. I swapped cheddar for feta and pecans for hazelnuts. Thanks! I have a nut allergy, so would something like Panko breadcrumbs work for this? Hi Kori! Yes, you can absolutely use panko crumbs. I would toast them a little – for like a minute – just to get a bit of a crunch. 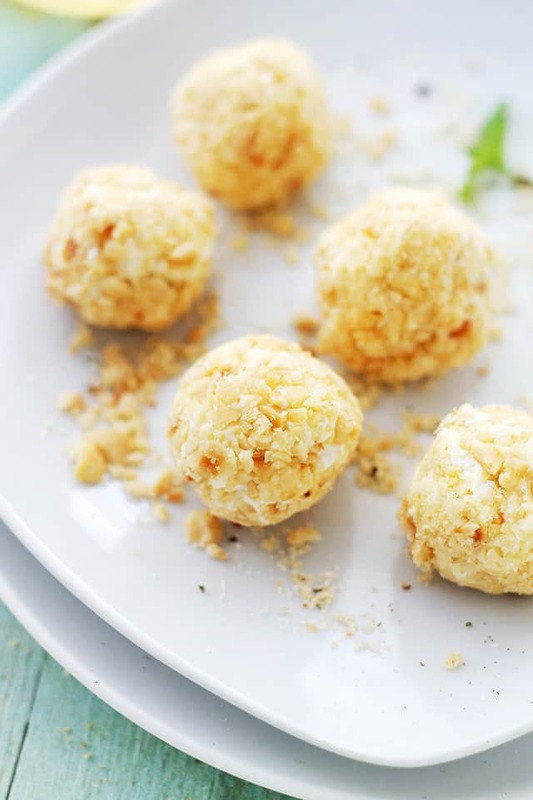 The crunchy texture works really well with the soft feta cheese. I rolled half of mine in nuts and half in some dried parsley (a light, scattered coat) and that worked well! Usually one night on the weekend I make a finger food tray for just me and the hubby. I pop open a bottle of wine and call it dinner! The feta covered olives will be a great variation from just plain olives! I don’t know if I can wait till the weekend to try it! These look awesome! Nothing would make my husband happier than those. zoozuspetals is my Pinterest name. Thanks so much. Hi! I just sent the invite. Please add at least one pin to the board, but you are welcome to add more than that. Thank you!! I would love to be able to pin from your board….I love olives, especially in a dirty martini!!!! I will need your pinterest username or pinterest email to send you an invite. Also, you have to follow at least one of my boards for the invite to go through – those are Pinterest’s rules. Thank you! Can’t wait to try these ! Who knew olives could be so versatile? I would like an invitation. Is pinning part of the way your enter this contest? Hi Carolsue! Yes, you will have to pin at least one pin to be entered. I just sent the invite. Thank you!! I love olives. I pop them in my mouth all the time. I can’t wait to try this! How awesomely delicious is this!!!! Please add karengdel to the board. Thanks! I love olives! 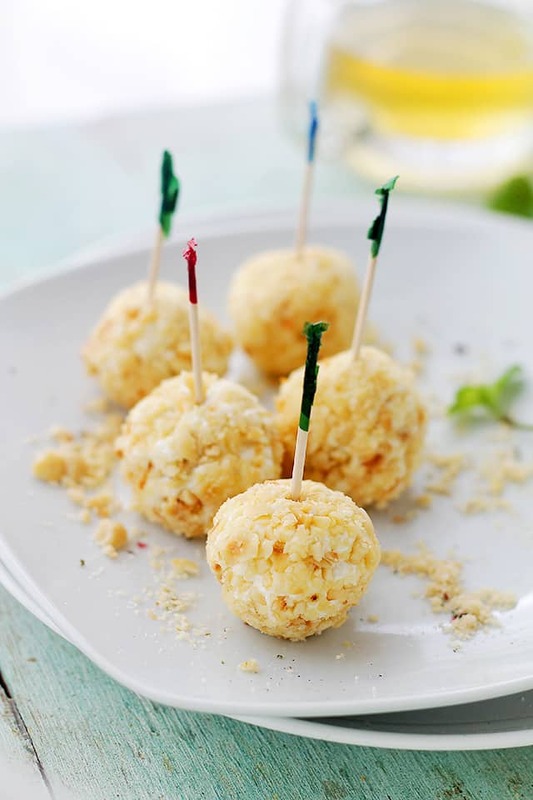 love these feta covered cheese olives. . great idea! I just sent the invite. Thank you!! These are so fun and I bet they are insanely addicting. I love olives! I’m not a fan of feta, but I’ll bet that subbing in a smaller quantity of bleu cheese would be delicious! This sounds like a good salty snack to serve with wine! You don’t like feta??? hehehe :)) Maybe you’re buying the wrong brand. 😉 I’m kidding. I know that it can be a bit on the strong side. I think bleu cheese will work out beautifully. Hope you have a chance to try them! Thank you, Karen!! Unfortunately, it’s not necessarily a dislike, rather it’s that certain cheeses trigger severe migraines, along with other good stuff such as oils from too much onion or garlic. I either reduce the amount of a triggering ingredient or find a good substitute for it. I am loving keeping up with your blog! My 18 month old daughter has actually enjoyed a few of your recipes! You’re like the olive guru! You just took my love of olives and blew my mind by rolling them in my favorite, feta cheese! Love it! Pinned. Wow! What a great idea! Feta and olives are staples on our breakfast table and you made a perfect combination from these two! I love that hazelnut coating, what a great bite! These look like the perfect party appetizer for the holiday weekend!! What a fun little appetizer, they look awesome!! This looks really good! I love olives and it’s a great way to do something different with them! I would like to be invited! Great! What is the email that you use for Pinterest?